I read that, and was wondering that in the first reaction shown they have used a tertiary butoxide where ether is formed because there is a primary alkyl halide but in the second reaction, they have used a methoxide. The Alkene formed is due to the tertiary alkyl halide my doubt here, is that is there any reason for taking a tertiary butoxide in one and methoxide in the other? Does the product also depend on the attacking species carrying the O-? 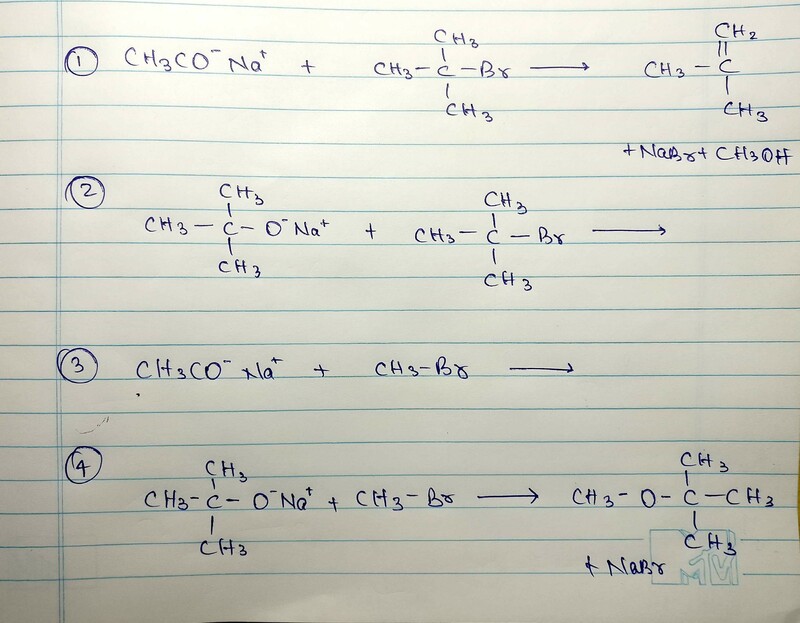 What I am trying to say, is that in the book, they first gave 4th reaction and if they were to follow the similar reaction then they should have mentioned something like 2nd reaction but they rather changed the tert-butoxide to a methoxide. Is there a reason behind it? And what would be the products for the other two reactions? Would it be a mixed product with no component in a majority? In Williamson ether synthesis, the reactive species is an alkoxide, which can act as a strong nucleophile or base. 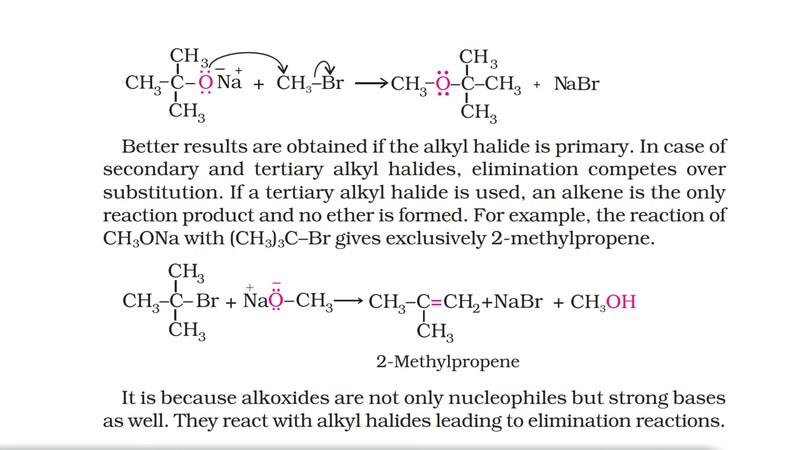 When reacted with an alkyl halide, if the alkoxide acts as a nucleophile in an SN2 reaction, the ether product is formed. If the alkoxide acts as a base in an E2 reaction, then an alkene is formed. So when considering a the reactivity of alkoxides, there is a competition between SN2 and E2. Which pathway will dominate is determined by several factors, and the steric nature of the nucleophile and electrophile are critical. With respect to the alkyl halide, we know that SN2 reaction is favored by sterically unhindered electrophiles. So the trend in rates is methyl > primary > secondary >> tertiary (to the point where this is generally impossible). Steric hindrance of the nucleophile will also slow the SN2 reaction. The E2 reaction is relatively insensitive to sterics, so if there is a competition between SN2 and E2, a bulky nucleophile/base will favor E2. That is why often potassium tert-butoxide is used to perform an E2 reaction. Let's analyze each of the reactions presented. 1) A primary alkoxide (sterically unhindered) is reacted with a tertiary bromide (very hindered). SN2 reaction is extremely slow for tertiary halides, and nine beta-hydrogens are available to deprotonate from the halide, so E2 reaction dominates, and we would expect the alkene is formed. 2) A tertiary alkoxide (very sterically hindered) is reacted with a tertiary bromide (very hindered). Again, SN2 reaction is extremely slow for tertiary halides, and nine beta-hydrogens are available to deprotonate from the halide, so E2 reaction dominates, we would expect that the alkene is formed. 3) A primary alkoxide (sterically unhindered) is reacted with methyl bromide. Not only is methyl bromide very unhindered, but there are no beta-hydrogens available to participate in an E2 reaction. SN2 is the only viable pathway, so the ether will be the only product formed. 4) A tertiary alkoxide (very sterically hindered) is reacted with methyl bromide. Again, not only is methyl bromide very unhindered, but there are no beta-hydrogens available to participate in an E2 reaction. SN2 is the only viable pathway, so the ether will be the only product formed. When is an alkene formed in a Wurtz reaction? Shouldn't the Hofmann product be preferred in this elimination?